It’s officially summer in our house: the weather’s warmer, the pool’s open, the kids are out of school, and the grill is fully operational. We’re working on some summer projects here that I thought I would share with you. My kids love the reading program at our local library, and we have already stocked up our shelves with tons of books we are planning to read. I was inspired by a reading challenge that a fellow blogger does with her daughter, so I have challenged my son as well. I gave him a list of about 35 books, and I challenged him to read 20 of them this summer. I gave him a few weeks head start before school got out to get the momentum rolling. If he finishes all 20 this summer, he will earn a prize (likely a day out together – still to be decided by Aidan). Aidan is stuck in a Geronimo Stilton rut (not a bad rut to be in, but still), so I designed the list to encourage him to read more high quality books and continue to advance his vocabulary and reading skills. Most of the books on the list are either books I loved as a kid or books I somehow missed, so we will likely be reading most of the books together. Having each of us read alternate chapter aloud seems to work well for us. The 7 books at the bottom are the ones Aidan has already read during this challenge, including Mrs. Frisby which we will likely finish tonight. The bonus in the challenge is that most of these books also have decent movies, so as we finish each book we reward ourselves with the corresponding movie. We have had some lively discussions about the differences in the storytelling between movies and books, why movies leave certain things out, and whether movie characters match what we have created in our heads. I’ll keep you posted on how this challenge works out. I am working on a project for the blog that will hopefully add another dimension and keep things interesting for you readers. I won’t spoil the surprise just yet, but hopefully we will have a periodic visitor who will share their thoughts with us on children’s books. Stay tuned – they may be ready to join us by the fall. Originally, I thought we would just plow through on the regular schedule, but now summer is underway and I am late posting for the second week in a row. A more realistic schedule is probably in order. Starting with today’s post, we will be moving to twice a month for new posts until the end of August. So we’ll see you again in 2 weeks! How We Discovered This Book: This book was in the new books bin at our library, and it looked like good choice for my kids who are very much interested in how things are made. A girl and her family pack up their belongings and move from town out into an empty field. They live in a trailer for 1-1/2 years as they build their own home from scratch. Every member of the family has a part to play in the hard work and love it takes to build a home. Given the increased focus on non-fiction books in our schools, I’m very interested in books that take a non-fiction topic and put a twist on it. This is a fiction book, but is factually based on real events and a real building process. Rather than make it a dry book about construction, the author intertwines the family story with all of the work they did to build their own home. Kids will learn, without really being aware they are learning. 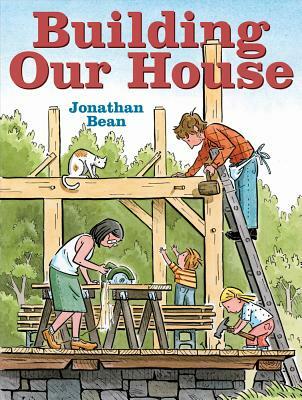 Both of my kids enjoyed this book, and I think they now have a slightly better appreciation for what it has taken for us to renovate our own house. They had lots of questions that extended the discussion into other books and videos. The whimsical illustrations pair nicely with the story. The author includes some of his parents’ photographs from their house building at the end, which is an extra treat. PBS has a fun activity where kids can measure and build a house for some of their favorite storybook characters. Scholastic has an activity focused on the business process from plans to completion. Improvise, and see what other kinds of houses you can build: birdhouses, gingerbread houses, or even a house for your guinea pig. This morning, I took my 7 year old son running with me for the first time. I’m usually very private and protective of my running. As a busy mom of two young kids, my runs are my only true alone time. I use the time to clear my head, reset my mood, and push myself physically. But I figured out a compromise – I completed my 3 mile run alone, and then I met my son at the bottom of the driveway. We ran almost a mile together, and then walked and ran the mile back. He ran 3/4 of a mile without stopping, which was pretty good for his first run of any distance. He loves to sprint, but he adapted to pacing himself well. I loved spending the one-on-one time with him. Running is something on my mental list of things I’d like to share with my children, and I enjoyed sharing my love for running with him. My dad has many interests, and he always shared those interests with my brother and me when we were young. We could try whatever we wanted – some things stuck, and some things didn’t. The best part of trying new things was trying them along with Dad, who fostered a sense of curiosity, self-drive, and life long learning. Some of the things I’d like to share with my kids are big- how to care for others, how to figure out what you love to do, and how to dream. Some are smaller but still important – how to ride a bike, play cards, or make a hand puppet. As a writer of children’s books, I feel it is my responsibility and privilege to share these same things with child readers. My challenge is sharing without being preachy or didactic. Children (including mine) can smell a “lesson” coming. It has to be put out there, like cherry to be picked. And then if you can make the cherry seem tantalizing and tasty, they will pluck it and make it their own.